Struggling server maker Sun Microsystems Inc. reached a sweeping, $1.6 billion settlement with Microsoft Corp. and said it plans to cooperate with its longtime nemesis, a company it had branded an unrepentant monopolist. The surprise agreement was accompanied by an announcement Friday by Sun that it is cutting 3,300 jobs and that its net loss for the fiscal third quarter will be wider than expected. The cuts represent 9 percent of its total work force of more than 35,000. The "broad cooperating agreement" with Microsoft ends Sun's $1 billion private antitrust suit against the Redmond, Wash.-based software giant. Sun's complaints also helped spark the investigation that led to the European Union's recent record fine against Microsoft. "It puts peace on the table in a big way," said Scott McNealy, Sun's chief executive, during a conference call Friday. As part of the deal, Microsoft will pay Sun $700 million to resolve the antitrust case, which was scheduled to go to trial in January 2006, and $900 million to resolve patent issues. Sun and Microsoft also will pay royalties for each others' technologies. "Our companies will continue to compete hard, but this agreement creates a new basis for cooperation that will benefit the customers of both companies," said Steve Ballmer, Microsoft's chief executive officer. 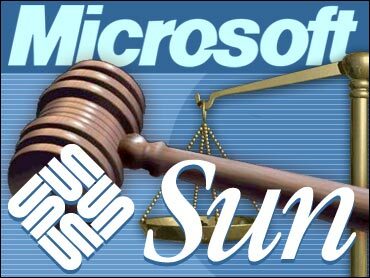 Sun's biggest claim — and the main charge in its antitrust against Microsoft — involved the Java programming environment Sun created to allow software to run on all computers regardless of the operating system. Sun said Microsoft violated its license agreement by creating its own version of Java, thus making it less universal. Though a settlement of that case was reached, both sides ended up in court again after Microsoft said it planned to stop supporting Java. Under Friday's agreement, Microsoft "may continue to provide product support" for its version of the software, called Microsoft Java Virtual Machine. The deal also creates cooperation between the companies in the technical area of Web-based applications and user identity management between Sun and Microsoft servers. Sun also agreed to sign a license that will allow its software to better communicate with Windows-based desktop computers. The agreement settles Sun's complaint over Microsoft's server communications that led to the EU's decision against Microsoft last month. That ruling also was based on Microsoft's bundling of its media player with its ubiquitous Windows operating system, though Sun did not play a role in that complaint. "Sun is also satisfied that the agreements announced today satisfy the objectives it was pursuing in the EU actions pending against Microsoft," Sun said in a statement Friday. The agreement is an unprecedented change in the relationship between the two companies. Sun's McNealy often railed against Microsoft, repeatedly calling Microsoft a monopoly and its .Net Web services technology "dot-Not." He often used the world "hairball" in describing Microsoft's proprietary software. But the anti-Microsoft rants quieted in recent months, as Sun struggled to post a profit and the companies worked at resolving the issues between them. On Friday, Sun executives said discussions have been ongoing since Sun licensed Java to Microsoft. Sun, once a shining star of Silicon Valley, also said it expects revenue for the quarter ended March 28 to be approximately $2.65 billion. Net loss will be between $750 million and $810 million, or 23 cents to 25 cents per share. Analysts polled by Thomson First Call were projecting a loss of 3 cents a share on revenue of $2.85 billion.